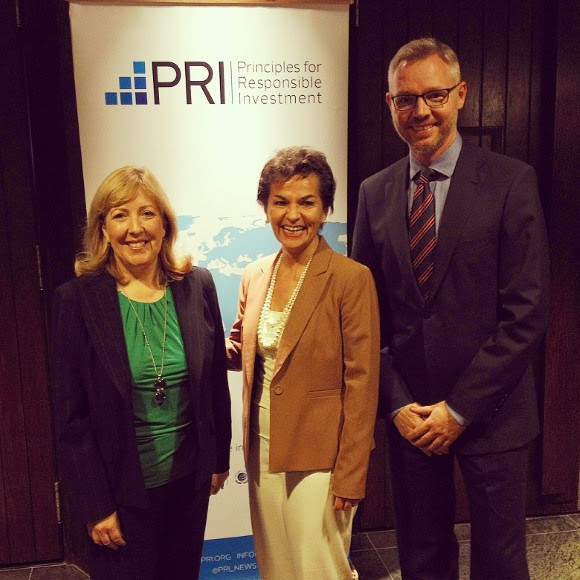 Fiona Reynolds, Christiana Figueres and Martin Skancke at PRI in Person in Montréal. This week, ahead of the UN Summit on Climate Change in New York, we saw strong support across the globe for more decisive initiatives to respond to climate change. To underscore the PRI’s commitment to this issue and help signatories take action, I am delighted to announce the launch of the Montréal Carbon Pledge at PRI in Person in Montréal this week. The PRI is inviting all investors to endorse the Pledge and commit to measuring and publicly disclosing – on an annual basis – the carbon footprint of their equity portfolios. Our current goal is to attract at least US$ 3 trillion of portfolio commitment in time for the UN Climate Change Conference in paris in December 2015. For many signatories, endorsing the Pledge will be an important first step towards measuring the long-term investment risks associated with climate change and carbon regulation. The Pledge supports the goals of the Portfolio Decarbonisation Coalition, also announced this week by our partners, UNEP Finance Initiative and CDP, to reduce portfolio carbon footprints. It will also serve as a long-standing legacy to this year’s sell-out PRI in Person conference, which attracted more than 600 delegates to Montréal . Christiana Figueres, Executive Secretary of the United Nations Framework Convention on Climate Change (UNFCCC), today described the Pledge as a “fantastic initiative” and encouraged all investors to endorse it as she delivered rousing opening remarks to delegates on the final day of the conference. “We need to put the Montréal Carbon Pledge on steroids,” referring to her desire to see the US$3 trillion target for investor endorsements exceeded. In addition to signing the Pledge, Ms Figueres called on investors to contribute to the climate agenda in two ways ahead of the paris talks. First, to ensure lobbying activities were aligned with climate action. She also said investors had a “sacred and legal fiduciary duty” to put conversations with their national finance ministries on their “to do” lists. To view Ms Figueres full remarks, which were met with a standing ovation from delegates, click here. Climate change is an important and urgent issue for investors and the PRI will continue to facilitate investor activity in this area. You can find more information about the Pledge and endorse it at http://www.montrealpledge.org. A number of service provider partners including yourSRI.com, Trucost and South Pole Carbon, are offering signatories discounted access to their portfolio measurement tools as part of signing the Pledge. The PRI will also be scheduling educational webinars over the coming months with early adopters and measurement partners to provide further information.